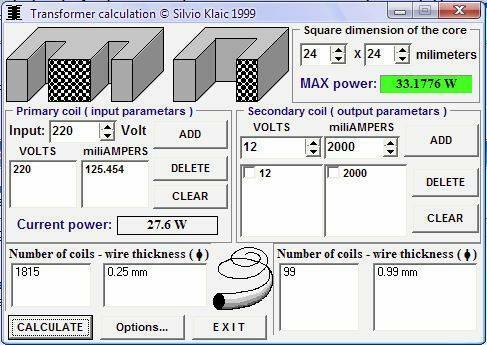 Transformer Calculation is program for calculating number of coils and wire thickness at transformer. If you don’t know anything about assembling transformers, please don’t use calculations from this program for building your own transformer! You can still use this program to determine how big EI core of transformer must be, if you plan to buy transformer. Note there are lots of transformers that are hybrids, so if you need transformer for amplifier buy right sized transformer. Hybrid transformer are ordinarily small and under high load it can overheat. Current version can calculate values only for standard transformer core, that’s “W” and “U” profile of core. Note that working frequency of all calculations is 50 Hz (you can use it for 60 Hz too), in next release I’ll add ability to change that frequency. This software is very useful to me. Very timely because I am going to rewind transformer. The software is working in my 64-bit windows. Thank you very much!!! Comment:can I use dis software with my android phone? Those are facing 64 bit unsupported issue please follow the link and you will be able run and install this program easily. This solution works for me! I think it’s very good software I’m really impressed. i really like your article and like to have your Transformer calculator for me.thank you very much.